Fans of the Borderlands series may recall the special edition of Borderlands: The Handsome Collection that was released earlier this year that included a remote-controlled Claptrap for your enjoyment. If you missed out on that and are still super into Borderlands, you're in luck. There will be another edition of the bundle coming out soon. 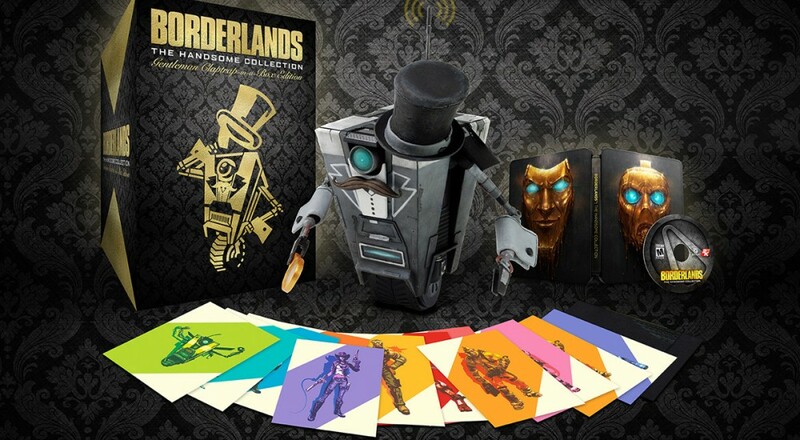 Dubbed the "Gentleman Claptrap-in-a-Box Edition," you'll get the same collectibles that were in the previous edition, i.e., the 12 lithographs, a steelcase box, all DLC and add-on content that's been released for Borderlands 2 and Borderlands: The Pre-Sequel, and a Claptrap you can control using an app on your phone. The one difference? Claptrap is in some fancy duds this time, looking all fancy. Interested purchasers should be aware that this edition is currently only available internationally and all you international folks should check with your local/regional 2K Store to pick it up. Sounds like Gearbox is trying to get this out before the New Year so you can purchase this as a holiday gift for that very, very special someone. Everyone in the U.S. will have to wait a bit longer. Gearbox plans on releasing the Gentleman edition on our shores at some point, but no news yet on when. Page created in 1.6266 seconds.